This is a 1932 Hélica! 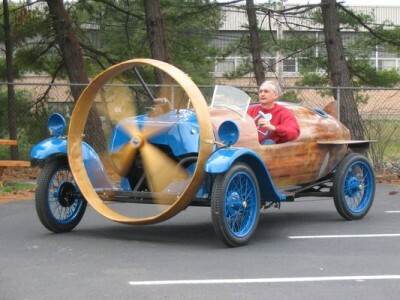 It’s a car that is driven by an airplane propeller. Here is a video of it driving around! It, of course, sounds exactly like an airplane. Here is another, longer and better video! 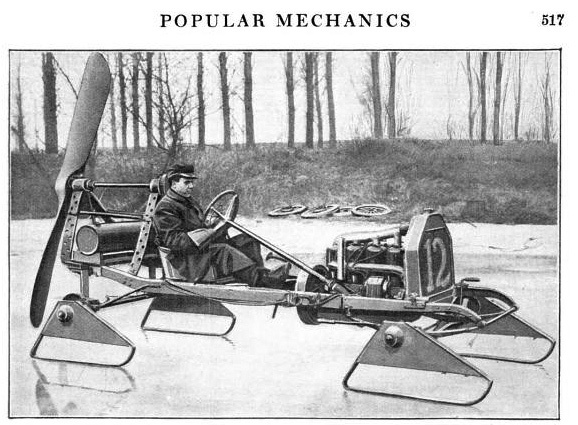 The Hélica was designed by Marcel Leyat, one of a number of French automotive engineers who experimented with “wingless aeroplanes”. These vehicles were very light, since there’s no need for a clutch or transmission. A propeller engine like this isn’t hooked up to the wheels at all; the wheels turn freely as the propeller pulls the whole apparatus through the air (just like an airplane taxiing). 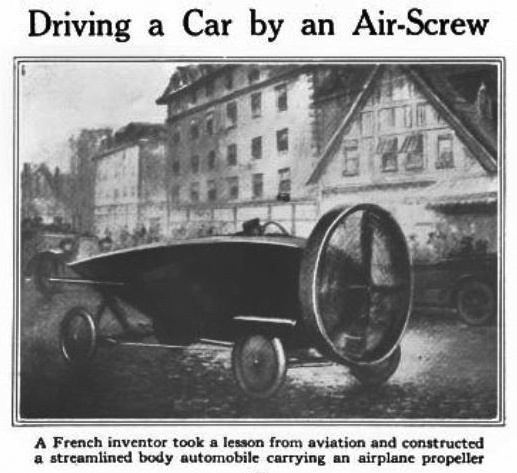 In February, 1921, you could read about Leyat’s cars in Popular Science. 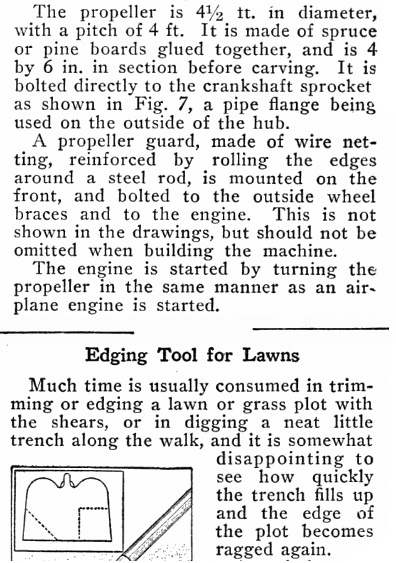 Or, in August, 1922, you could read Popular Mechanics and learn how to build your own propeller car. 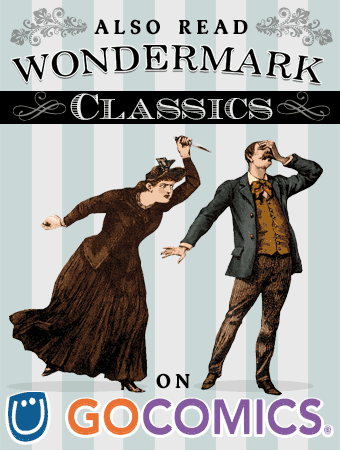 • Google Books has huge, freely-browsable archives of them both. Often, when I’ll search the Google Books database for articles on a topic, results will come up from those titles first. This is at least partially due to the fact that there are just a ton of them digitized. But! I also love this type of magazine for another reason. There are magazines and websites today, like Make and others, that are about doing projects and constructing things. I also really like reading Kevin Kelly’s Cool Tools, because it takes as its foundational baseline assumption that you can make, or repair, or adapt something yourself. 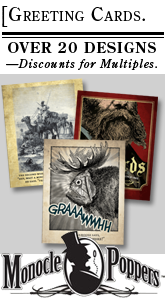 We sometimes picture old-timey turn-of-the-century stuff as having an artisanal or hand-crafted character. That has truth to it — as we’ll see in a moment — but the Industrial Revolution also enabled the opposite: mass production. Tools, equipment, vehicles, housewares, clothes… For the first time, they could all be ready-made. 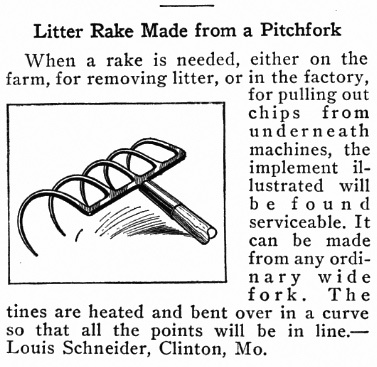 For the farmer out in the sticks, the Sears-Roebuck catalog was a godsend; he could order anything from a hammer to a horsecart and have it delivered by train to his local station. But, as often happens in times of transitions, there was also a pushback against the undiscerning march of technology — specifically, a renewed focus on what could not, or could only inferiorly, be created by machine. 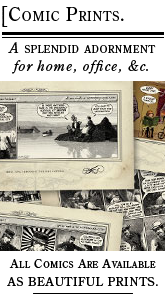 …Of late years, however, a kind of revival has been going on, as a protest against the conviction that, with all our modern mechanical achievements, comforts, and luxuries, life is growing “uglier every day,” as Mr. Morris puts it. 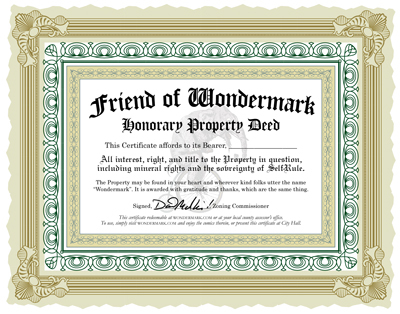 …If Art is not recognized in the humblest object and material, and felt to be as valuable in its own way as the more highly regarded pictorial skill — the arts cannot be in a sound condition; and if artists cease to be found among the crafts there is great danger that they will vanish from the arts also, and become manufacturers and salesmen instead. So at the turn of the 20th century, the Industrial Revolution had wrought a world in which powerful machines and tools enabled us to manipulate materials and forces, like aluminum and gasoline and electricity, in ways never before possible. But in this same world, people still wanted things to be beautiful, and customized, and repairable, and modifiable. 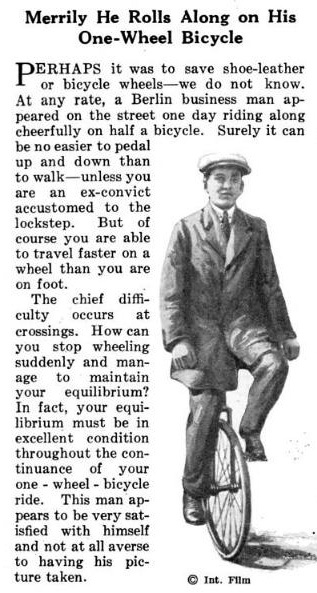 This is why I love early mechanical magazines: because they let us visit a world in which it was expected that we were masters of the objects in our lives; a world in which the machines we interacted with, and made labor for us, had workings we could understand and, to an extent, control. 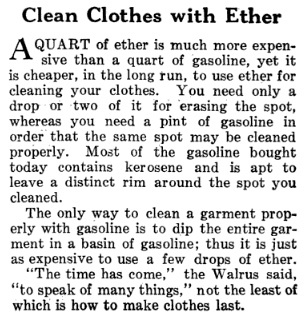 Gasoline-fueled motorcars were simple enough to be be fixed quickly with a wrench; or, if something more severe became damaged, the town blacksmith could fabricate a replacement for you. In this pre-electronic age, the workings of things were visible, and thus, things could be worked. Now, I know that it’s tricky to judge a society by its media — the audience for these magazines in particular wasn’t everybody in the world. It was a magazine for a certain type of person. …And be able to make them. Let’s be clear! None of these are particularly hard projects for people with some mechanical ability and the right tools and materials. But today, it is much less common to have access to those tools and materials, to say nothing of the inclination to use them. I don’t know how I would heat up pitchfork tines today if I wanted to! 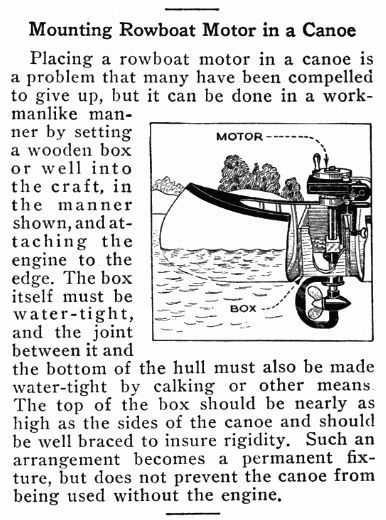 In August 1922, Popular Mechanics published one of my favorite examples of what one could build — or perhaps what one was assumed to be able to build, based on how many shortcuts and abbreviations and elisions are in the instructions — in a decent home workshop. 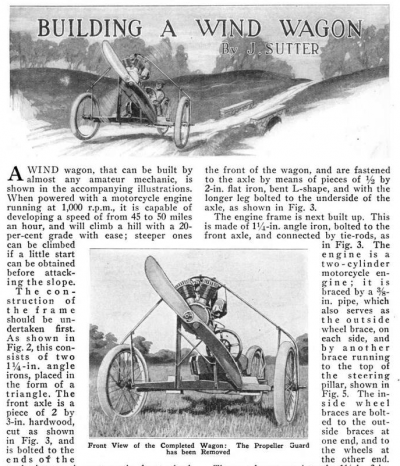 The “wind wagon” has a long but little-known history in aviation. The term was used to refer to any of a number of propeller-driven land vehicles. Usually fitted with a pusher prop, wind wagons were sometimes used as test platforms for airplane engines and propeller designs, as well as teaching tools to familiarize would-be pilots with the inertia of a propeller-driven engine. 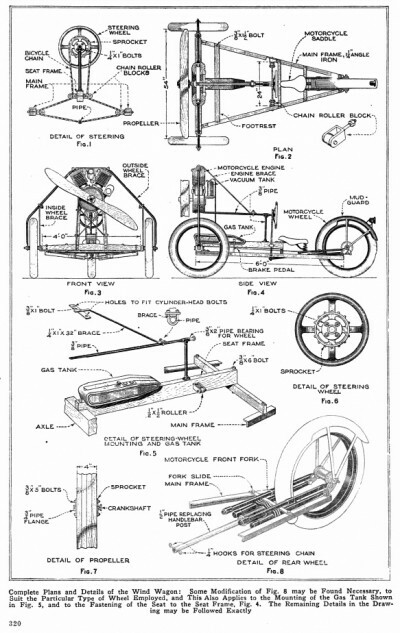 Unlike motorcars, wind wagons had no gears, so it was possible to “stall” while going up a hill, if the propeller wasn’t putting out enough thrust to offset the craft’s weight. Wind wagons go back to Glenn Curtiss, one of aviation’s earliest pioneers. In 1905 he built a wind wagon to test what was then a very unproven propeller design. Here’s a replica at the Curtiss Museum. 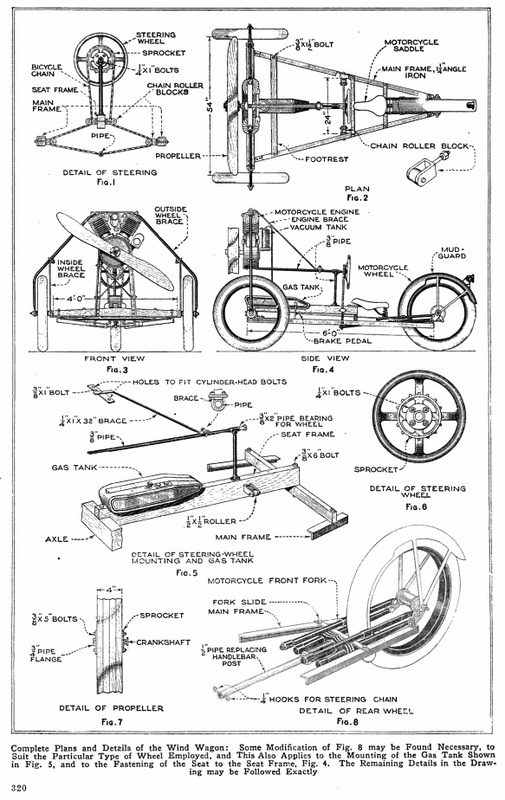 …There is no patent on the idea and any of our readers who have a small gasoline motor can build their own craft from the suggestions given in the illustrations. …The same idea has just been utilized in France, where M. Archdeacon, of Acheres, applied the propeller to a motorcycle. In his case the propeller was carried in front, which had the effect of pulling instead of pushing. The entire outfit weighs 160 lb. and made a speed of 49 1/2 miles per hour over short distances. The tests were required by the authorities to be made on secluded roads, for the French horses go wild as the big whirling blades come toward them. Wind wagons were fun diversions for the mechanically minded; the basic technology could be adapted to ice or water just as easily. 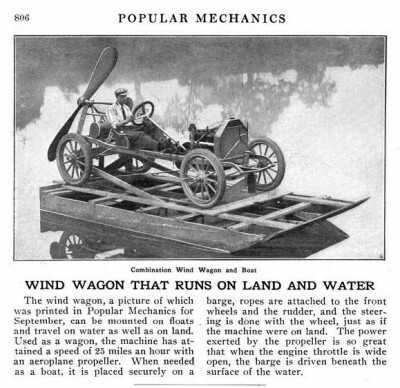 And of course this same basic idea survives today as the airboat. But that’s all you get. The text also helpfully leaves out a lot of detail — I guess because they assume you already know how to bend and join angle iron. And that’s it! That’s what I love. This is a world in which that can be taken for granted. 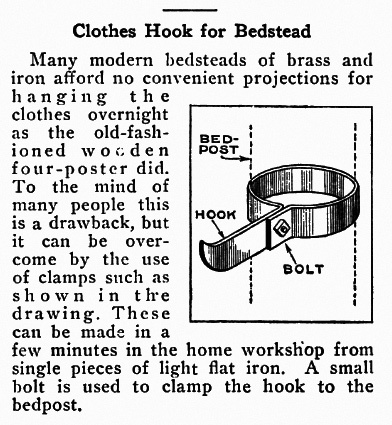 I don’t know whether these plans, in 1922, would have been practical or aspirational. I don’t know whether the typical tinkerer’s home workshop would have been adequate to build the wind wagon, nor whether the surrounding area would have been a good place to go tearing around at 50 miles an hour, ripping leaves off of trees and terrifying the horses. But I love reading these magazines, and paying a visit to a (possibly made-up) world where that is ever-so-casually possible. This entry was posted on Wednesday, November 12th, 2014 at 11:55 am and is filed under Blog. You can follow any responses to this entry through the RSS 2.0 feed. Both comments and pings are currently closed.